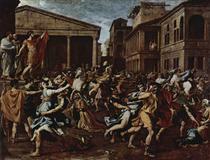 A French classical painter, Nicolas Poussin has been an inspiration for countless number of great artists since the 17th century. At the age of 18, Poussin ran away from his hometown in Normandy, France, to Paris and began studying in the studios of the Flemish painters Ferdinand Elle and George Lallemand, who later became famous as the teachers of the great Nicolas Poussin. At the age of 10, he traveled to Rome, where he received two major commissions, Death of Germanicus and the Martyrdom of Saint Erasmus, the latter of which was publicly debuted, although it marked the last time he was to receive a public commission from the church. 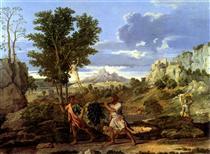 After his first public debut, Poussin fell seriously ill, and was taken to the house of his friend, Jacques Dughet, whose daughter nursed him back to health. 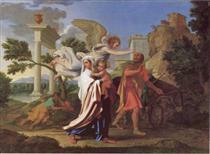 The next year, Poussin and Dughet’s daughter, Anna Maria, were married. 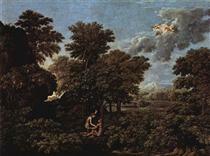 While in Rome, Poussin met with many other artists, and befriended those with classical leanings, like himself, eventually forming an informal academy of artists and patrons, all opposed to the overbearing Baroque style. 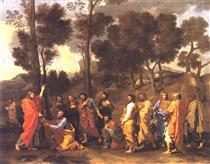 After his last church commission, Poussin relied solely on the private patronage for his works, and so in 1640, returned to France an was hired as s court painter by Louix VIII, who gave him the title of First Painter in Ordinary. Although he completed many works during his stay in France, he grew disgusted with French social intrigue, and so he withdrew back to Rome, where he continued to complete a great number of varied works each year. 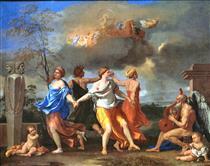 In his later life, Poussin suffered declining health and a tremor in his hand, which may have affected his painting ability. Upon his death, he left no heirs, except for his wife’s brother, whom he adopted as a son, and who took the Poussin name. After his death, King Louis XIV amasses a huge amount of his works, many of which now hang on the Louvre, which has an entire gallery dedicated to just Poussin’s works. He was persuaded to return to France in 1640 to be First Painter to the King but, dissatisfied with the overwhelming workload and the court intrigues, returned permanently to Rome after a little more than a year. Among the important works from his later years are Orion Blinded Searching for the Sun, Landcape with Hercules and Cacus, and The Seasons. 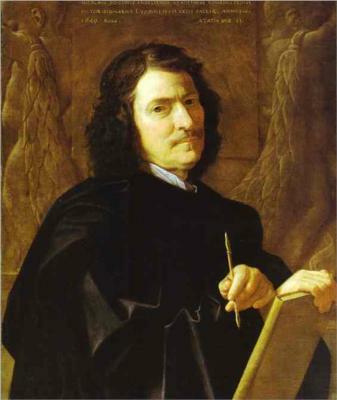 Nicolas Poussin's early biographer was his friend Giovanni Pietro Bellori, who relates that Poussin was born near Les Andelys in Normandy and that he received an education that included some Latin, which would stand him in good stead. Another early friend and biographer, André Félibien, reported that "He was busy without cease filling his sketchbooks with an infinite number of different figures which only his imagination could produce." His early sketches attracted the notice of Quentin Varin, who passed some time in Andelys, but there is no mention by his biographers that he had a formal training in Varin's studio, though his later works showed the influence of Varin, particularly by their storytelling, accuracy of facial expression, finely painted drapery and rich colors. His parents apparently opposed a painting career for him, and In or around 1612, at the age of eighteen, he ran away to Paris. He arrived in Paris during the regency of Marie de Medici, when art was flourishing as a result of the royal commissions given by Marie de Medici for the decoration of her palace, and by the rise of wealthy Paris merchants who bought art. There was also a substantial market for paintings in the redecoration of churches outside Paris destroyed during the French Wars of Religion, which had recently ended, and for the numerous convents in Paris and other cities. 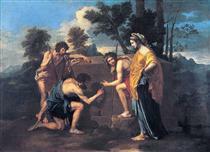 However, Poussin was not a member of the powerful guild of master painters and sculptors, which had a monopoly on most art commissions and brought lawsuits against outsiders like Poussin who tried to break into the profession.